It’s hard to address the faults of Hours, of which there are multiple, because not only is this the movie that will be forever pegged with the citation of being the one that came out right after its star Paul Walker’s tragic death, but also because every millimeter of this film feels intensely personal and dedicated, from Walker to writer/director Eric Heisserer. This is a project of great feeling and purpose, and certainly some of that prestige comes through, but the movie often struggles at achieving it, sometimes quite obviously, sometimes maddeningly almost there. Of course, there are rows of positive attributes to be praised, but they are not enough to cover up the things that keep this from being as good as it clearly had the ability to be. Walker plays Nolan Hayes, whose wife Abigail (Génesis Rodríguez) has been rushed in after going into labor, five weeks premature. It’s August 29, 2005, and they are in New Orleans, Louisiana. Hurricane Katrina has begun barreling down on the city, and the hospital’s resources are limited. A doctor (Yohance Myles) informs Nolan of some bad news: Abigail has died giving birth, and their newborn daughter is having trouble breathing on her own, and has to be placed on an incubator until her signs improve. The hurricane is still moving inland, so the hospital is also being evacuated. Nolan refuses to leave, insisting that he stay in the room with his child. When the power goes out, the incubator starts on a bad battery backup – it can only hold up to three minutes of power at a time. Forced to stay awake, in the middle of a lethal storm, while manually cranking a small generator to keep the machine up, Nolan is isolated and without resources as time passes by. 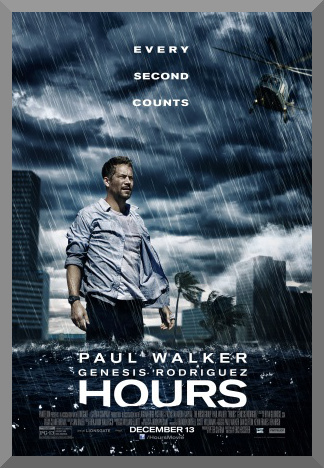 Let’s get this out of the way – Paul Walker’s performance is very good. It may not be particularly great or noteworthy all in all, but in the quest to create a sympathetic and involving character amidst the story, he thoroughly succeeds. This is important, because this is very much an exercise in restrained acting. A good chunk of the 97 minute movie is just him, occasionally interspersed by a flashback from his life with Rodríguez’ Abigail. They have good chemistry, and make the emotional heft behind the story more compelling. The cinematography by Jaron Presant is atmospheric, eerie, and tense, with some very effective sequences where Nolan wanders around a darkened, empty building. But here’s the stumbling block – Heisserer’s screenplay. It plods along, often feeling a bit disconnected and overlong, and dilutes some of the feeling of what’s otherwise happening. It is a script that somehow simultaneously manages to feel urgent and meandering. The structure is inconsistent, sometimes feeling snappy and rigid but other times feeling sloppier, going through the motions until it can give its protagonist another major challenge to get through. Mix this in with some questionable pacing and unfortunately we can conclude the two main problems with Hours are two of the most visible factors of the movie – how it’s written and how even it is (or lack thereof). There’s only one particularly major reason to see Hours, and that is to see Paul Walker’s performance, in what was clearly an attempt to stretch the actor’s abilities in an incredibly challenging, sealed off performance, playing a character under extreme duress and grief. The fact that he does well is only more of a testament to talent that was largely underused in the actor’s most famous roles. Otherwise, this is a production that has all of the effort and intent that you could ask for, but suffers when it comes to the overall execution of those ideas and desires. This is a shame, because is clearly the means here to make a very good movie, and with some more polishing on the script and a bit more tightening in pacing and editing, it could have definitely gone there. But these issues are not properly addressed within, and instead, we are left with a large mountain of “could-have-been”, stumbling down and making a not quite recommendable movie around a very much recommendable central performance.